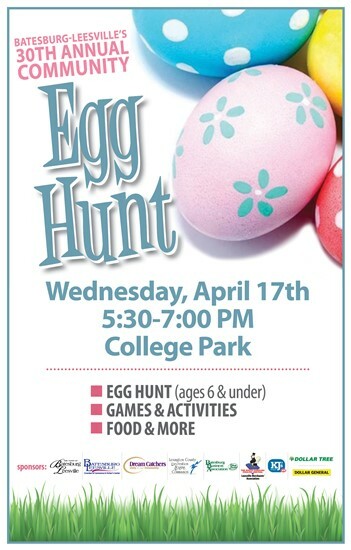 The 30th Annual Town Egg Hunt will take place on Wednesday, April 17th from 5:30pm-7pm in College Park. This year's event will include food, games, and activities for families and small children. More than 5k eggs have been prepared this year for hunters ages 0-6. 0-1: egg play area for pre-hunters with goody bags available while supplies last. Great for photos and fun. 2-3: our youngest of the two hunt groups. Hunt will start at 6pm close to Midlands Tech in the park. 4-6: our older hunt group. Hunt will start at approximately 6:10 west of the outdoor stage. This year's sponsors include: Town of Batesburg-Leesville, B-L Chamber of Commerce, Dream Catchers, Lexington County Recreation and Aging, Batesburg Business Association, Leesville Merchants Association, KJ's IGA, Dollar Tree, Dollar General, Lexington County Sheriff's Department, Christ Community Church, Hulon Baptist Church, and others.